When I moved to New York City in 1957 my first job was for a company called Sleight and Hellmuth, Inc. They made printing ink and occupied the basement and first two floors in this building. It certainly never occurred to me that 29 years later I would be taking a photograph of the sign on the side of the building! Actually, Sleight and Hellmuth, Inc. had only come into existence earlier that year, 1957, from a merger of Charles Hellmuth Printing Ink Corp. with the Sleight Metallic Ink Co. Charles Hellmuth began around 1892 in New York City at 30 Platt St. and moved a year later to 379 Pearl St. According to Edward G. Geiger, The American Handbook of Printing, Second Edition, New York, Oswald Publishing Co., 1909, "'Charles Hellmuth' was the name of a bookkeeper at Kast & Ehinger, ink manufacturers." 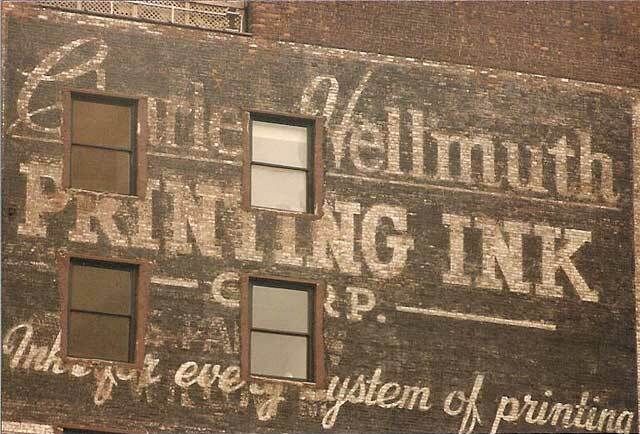 Kast & Ehinger were ink manufacturers based in Stuttgart, Germany, and they appear to have borrowed/invented the Charles Hellmuth name when they established their American outlet in New York. This ad from the Sept. 1893 issue of Music and the Drama shows Charles Hellmuth, 379 Pearl Street, as "Sole Agents for the United States" for Kast & Ehinger, Stuttgart, Germany. Trow's Copartnership Directory for New York, 1901, names Charles A. Stickel as the only partner at Charles Hellmuth. Charles A. Stickel is listed in the U. S. census for 1900 as an alien born Germany, living at 128 E. 92nd St., Manhattan. A boarder with the Stickel family is Richard Deusch, also an alien born Germany. The 1909 Trow Copartnership directory lists Stickel as president at Charles Hellmuth, and Richard Deusch as secretary. Directors in 1909 were Charles A. Stickel, Charles Auinger, Richard Deusch, Julius Nida and Herman Schoeffler. During World War I the assets of Charles Hellmuth Inc. were confiscated by the U. S. government as alien property under the provisions of the "trading with the enemy act" passed by the U. S. Congress in 1917. The assets were subsequently bought for $320,000 by Rose & Paskus (a law firm) for Bernard R. Armour, 465 West End Ave., New York. Bernard Armour seems to have bought the Hellmuth Building as well as the rights to the Charles Hellmuth trade name and a multitude of trademarks used for Hellmuth products (Report of the Alien Property Custodian, April 10, 1922, Senate Documents, 67th Congress, 2d Session, 1921-22). Bernard Richmond Armour (1890-1949) was president of the American Aniline Products Co. (founded 1917) and took over as president of Charles Hellmuth, Inc. in 1919. His obituary in the New York Times (2 Dec. 1949, p. 29) lists numerous businesses associated with his name including American Aniline Products, Inc., Heyden Chemical Corp., Charles Hellmuth Printing Ink, and Hartford Rayon Corp.
Charles Hellmuth were located at 46-48 E. Houston St. from 1898 to 1906, then built their own building here at 154 W. 18 St. (see 1906 ad for Charles Hellmuth). The Hellmuth slogan was "Inks for every system of printing." The Sleight Metallic Ink Co. was begun in Philadelphia. They had a New York branch at 154 Nassau St. in 1911, moved to 131 E. 23 St. in 1921, to 75 West St. in 1937 and had another location on Canal St. from 1944 (see 1950 ad for SMICO inks). Sleight and Hellmuth left their 18th St. location in 1973 and went out of business around 1980. T. J. Hayes Printing Co. was founded in 1907 by Timothy J. Hayes (1853-1925). Hayes was an immigrant from Ireland (his entry in the 1900 U. S. Census says he immigrated in 1873, but the entry in 1920 gives this as 1886). The company was located at 154 W. 18th St. from 1913 to 1944. Their specialty seems to have been printing posters. They were known as T. J. Hayes Printing Co. until around 1936, then became Hayes Printing Co. until going out of business around 1960. The Hayes sign in the Municipal Archives photo, then, should date approx. 1936 to 1941. Timothy Hayes had a number of associates in his business, including Jeremiah Keever Rettenberg (1873or75-1952). He was an immigrant from England, and appears in the U. S. Census of 1900 where his occupation is listed as "Engraver (wood)." Rettenberg's involvement with T. J. Hayes began around 1910 and continued into the 1930s. Another associate was Thomas F. Ahearn (1885-1916). Thomas Ahearn was the son of John F. Ahearn (1853-1920) who was a prominent figure in New York politics. John F. Ahearn was elected state senator several times and became Manhattan Borough President (1904 to 1909). His tenure as Borough President was rife with scandal, however, and New York's governor ordered him removed from office. On the death of his son in 1916, John F. Ahearn assumed the position of treasurer at T. J. Hayes Printing Co. Another figure at T. J. Hayes was William John Murray (1884-1966). He married John F. Ahearn's daughter, Anna Marie Ahearn (1887-1967), approx. 1910, and seems to have joined T. J. Hayes in the 1930s. Like his father-in-law William J. Murray was elected a state senator (serving from 1937 to 1944). He was president of Hayes Printing at the time of his retirement in the mid-1950s.